Cultural barriers between genres are collapsing. Ask the average young person what kind of music they listen to and you’re likely to get a reply somewhere along the lines of “a bit of everything”. Even in the rock world, the most traditionally tribal sector with the greatest inherited feelings of isolation from other music scenes, people that solely listen to bands with distorted guitars are becoming an endangered species. While there remains a minority of keyboard warriors determined to decry, or worse ignore, 90% of the music in existence, the more mature and discerning listener is unlikely to be so close-minded. Even pop, which in terms of values if not sound represents rock’s polar opposite, no longer needs to be thought of as a guilty pleasure by fans of the hard stuff. 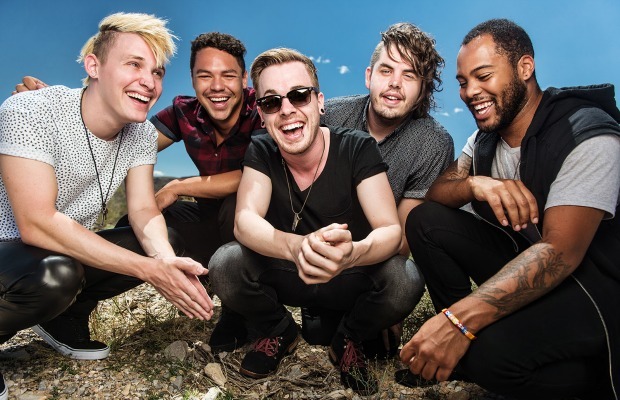 All this is very good news for Set It Off. The orchestra-backed pop punk of unexceptionable 2012 debut Cinematics has been largely swept under the carpet; album number two moves in a whole new direction. A smooth transition is at least provided by the first two songs, ‘The Haunting’ and ‘N.M.E.’, using Panic! At the Disco carnival weirdness and Fall Out Boy arena choruses to bridge the gap. From there, though, the music takes on an even more pop-centric base than either of those two bands’ most recent efforts. Duality invites comparisons a world away from those of its predecessor; the sassy ‘Bleak December’ and more mournful ‘Bad Guy’ could easily have come from OneRepublic, while not much separates ‘Ancient History’ and its springy hook from One Direction. If that sounds like a criticism, it’s not. In fact, Set It Off are really rather good at writing pop music. It doesn’t matter that ‘Why Worry’ is at times closer to Britney Spears than Brand New, it’s absolutely massive, with one of the best hooks of 2014 and an inherent playfulness that sounds entirely honest. The similarity of ‘Miss Mysterious’ to ELO’s ‘Telephone Line’ doesn’t detract from the fact that it’s a peach of a ballad that ends with a magnificent big Broadway pay-off. Perhaps the clearest recent precedent for this sonic shift is Breathe Carolina’s entirely natural sounding leap into chart pop on Savages, but in Set It Off’s case the change is even more successful as the results don’t feel as mired in contemporary trends (though Duality’s shimmering title track could give most in the charts a run for their money). Vocalist Cody Carson was always going to be the deciding factor of whether a shift such as this could be truly pulled off, and thankfully he steps up to the task, proving that he can rein in his theatrical eccentricities when necessary on the more straight-ahead material; though as the nursery-rhyme silliness of brassy romp ‘Wolf in Sheep’s Clothing’ attests, he can still play pantomime jester when needed as well. The musicianship of the rest of the band is difficult to analyse as they typically play second fiddle to the sleek production, and how these songs are going to be replicated live as a five piece rock band is an interesting future dilemma. More pressing concerns are the odd placement of the three more sincere tracks together at the album’s very end – draining the dynamics that the album could have had were they more evenly spread – and the occasional slip-up, the over-earnest ‘Tomorrow’ for instance saved by a typically warm guest slot from Jason Lancaster. That Set It Off are more or less a pop group in a rock band’s clothing shouldn’t put off listeners, as taken for what it is Duality is a very strong collection of songs with choruses that will lodge in your brain for days and enough replay value to keep you coming back for more. The angle that they’re attacking the mainstream’s sonic territory from means they likely won’t achieve the success that music as good and accessible as this should, but those in the know who appreciate all genres would do well not to ignore this record.